State of the art- one of its kind in PNG. 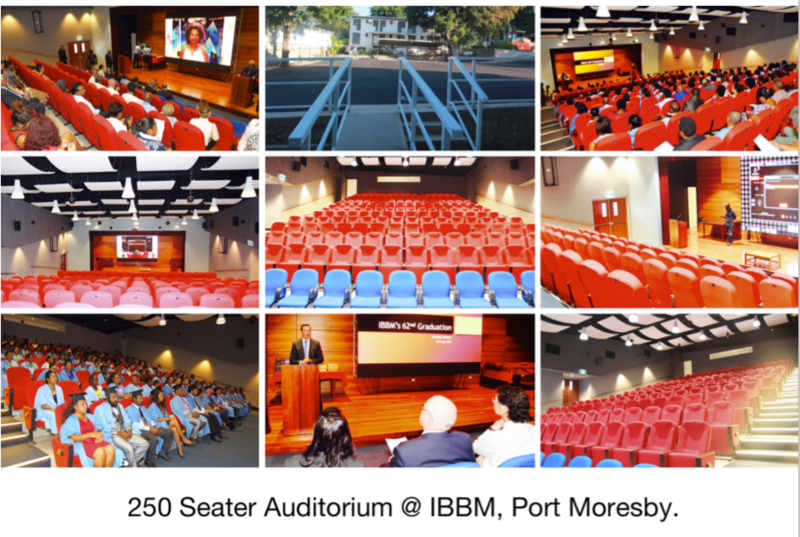 Ceremony for the 250 Seater Auditorium Building was officiated by the Chairman and Board Members of IBBM on 30th April 2016. The facility offers an excellent infrastructure for conducing workshops, seminars, video conferencing and Annual General Meetings. The Construction took 24 months and over 6 million Kina in costs. The project was completed within budget and within time. All local suppliers and locally sourced goods were used in this project. We are proud to share that most of the profits saved over the years of IBBM’s journey were reinvested back into the institute to build his facility for members to use over the years. IBBM’s 62nd Graduation Ceremony was the first function held at the Auditorium where 150 graduands and their families participated.  A Non-refundable Deposit of 20% is required to confirm your booking.  Corporate Members and ACM will receive 15% discount on all Tariff. Email: info@enterprisecentre.com.pg or customerservice@ibbm.com.pg to BOOK your next event.